File contains two copies of the tenor saxophone part of a composition entitled "Muraille de Cayne." "Robert Leriche" is handwritten at the bottom of one of the parts, potentially indicating him as the composer. This series contains manuscript copies of several of Ivan Maxwell Gillis' own compositions. Item is the graphic notation score used by the rhythm section for part 3 of Nasca Lines. The score was used by the drummer for the premiere performance. As the drums are tacet for the first page, this page is not included. Item is a copy of Martinů's settings of folk songs for voice and piano, with pencil annotations by Anthony Pugh. Item is a copy of the song "O Blätter, dürre Blätter" for voice and piano, from Zemlinsky's Gesänge. The copy is annotated in pencil by Anthony Pugh. Item is a copy of Scriabin's fifth piano sonata, annotated in pencil by Pugh. 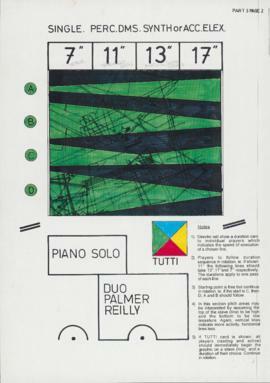 Item is a copy of two "Pulse Tracks" by Paul Cram. 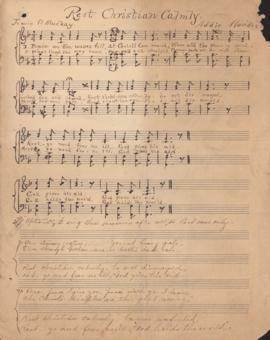 Item is the manuscript for a hymn "Rest Christian Calmly," with words by Jessie P. MacKay and music by Addie MacKay. The music is for four-part chorus (soprano, alto, tenor, and bass) and is in F Major with four verses. File contains four annotated copies of Naylor's handwritten piece for piano. File contains five annotated copies of Naylor's score for 11 instrumental parts. Each part includes melodic guidance for improvisation and performers are instructed to switch between parts freely. Item is a copy of Prokofiev's sixth piano sonata, annotated in pencil by Anthony Pugh. Item is a copy of Prokofiev's flute or violin sonata, annotated in pencil by Anthony Pugh. Item is a copy of Shostakovitch's violin sonata, annotated in pencil by Pugh. 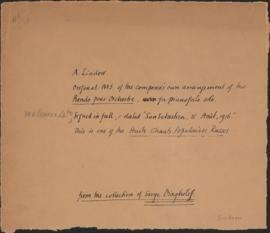 Item is a copy of Shostakovitch's cello sonata, annotated in pencil by Pugh. Item is a copy of Prokofiev's first violin sonata, annotated in pencil by Anthony Pugh. Item is a copy of one of Eugène Ysaÿe's Six Sonatas for solo violin, annotated in pencil by Pugh.